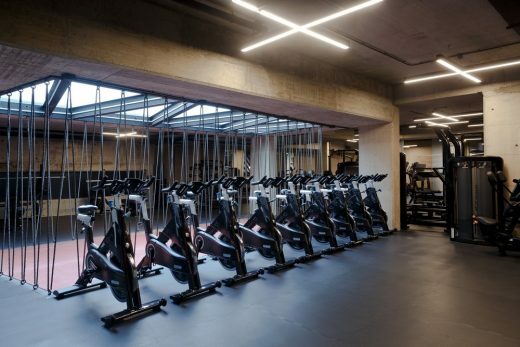 Rabih Geha Architects has designed the interior for the U Energy boutique health club in Lebanon, with a philosophy committed to continuous improvement through knowledge. 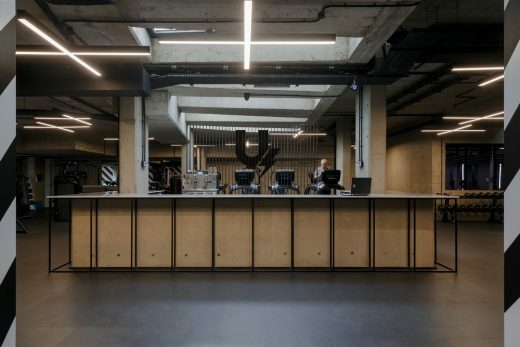 Located at Backyard Hazmieh – a melting pot of restaurants, coffee shops and pubs – U Energy was borne out of a need for respite from the hectic nature of daily life. 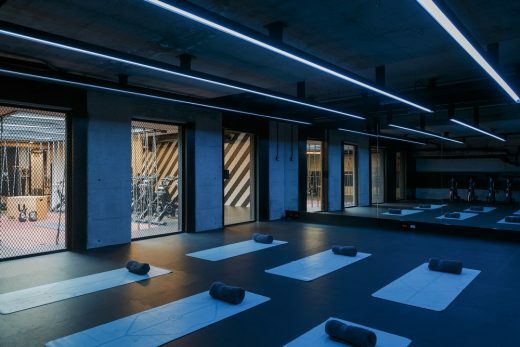 Team culture is a strong focus for U Energy and RG/Architects worked closely with the team to ensure that the mission of the brand was echoed throughout the space. 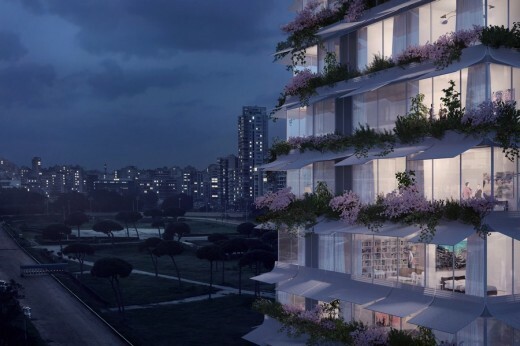 RG/Architect’s vision is regularly intersected with the demands of their clients combined with the modern world. Founder Rabih Geha is focused on collaboration and bringing the stories of those he works with to the forefront of his designs. 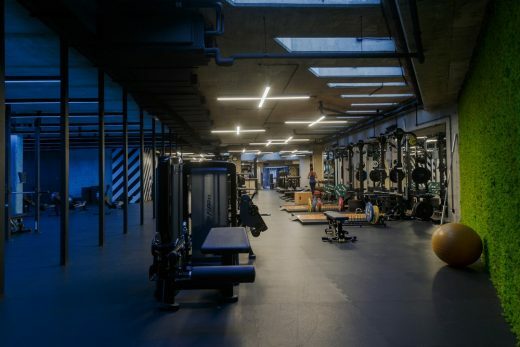 Encouraging connection and interaction, the 1200-square-metre gym space is completely open, divided only by structural concrete pillars and the industrial-style equipment within it. 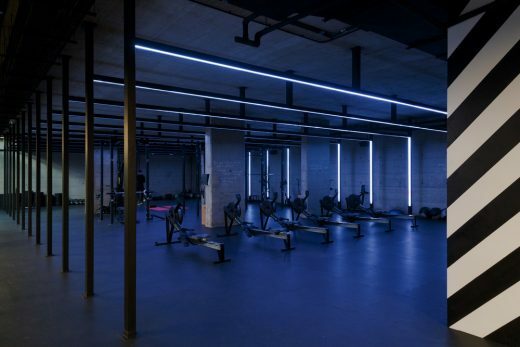 The underground gym features skylights to allow beams of light from above, while neon lighting aids progression during workouts and creates a trendy atmosphere. According to ‘The Organism’ by Kurt Goldstein, light travels through neurological pathways and affects the pineal gland in the brain, which affects our body, mind and emotions. Green has a healing effect and boosts satisfaction, which can make your workouts more enjoyable. Red can invigorate you and add zest to keep-fit sessions. while tranquil shades of blue produce calming chemicals in the body. The colour blue increases people’s productivity and research shows weightlifters lift heavier weights in blue rooms. 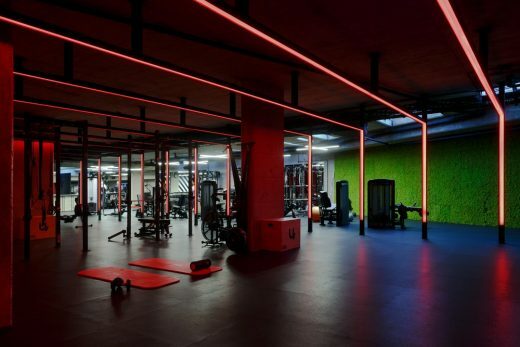 The linear structures fitted with said neon lighting strips run parallel across the space, creating invisible dividers subtly highlighting personal zones but also encouraging a competitive culture amongst the gym-goers. 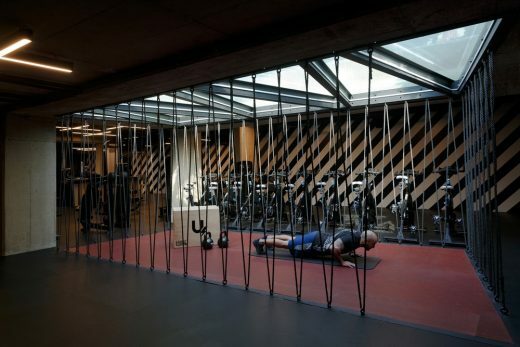 An area for stretching is cut-off only by thick black cords, off-setting against the feature monochrome striped walls and adding to the geometric nature of the environment. 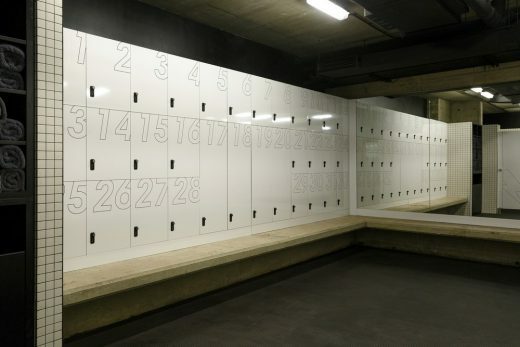 There is a separate studio for spinning classes and an area for lockers and changing rooms. 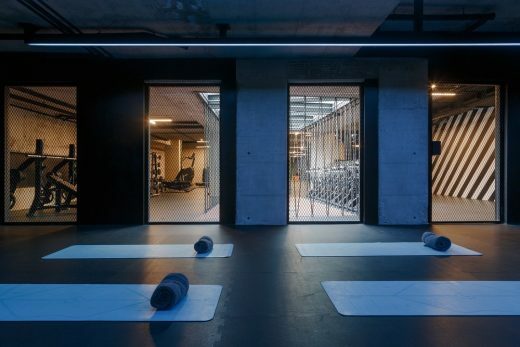 The remainder of the gym remains raw and industrial in style allowing members to focus only on enhancing their well-being without the busy distractions of Beirut. The result is an edgy and dynamic, motivational setting conducive for a healthy, energetic and comfortable workout.